West Central Initiative is pleased to introduce “Live Wide Open,” a bold new campaign to encourage people to return, move to and, yes, to stay, in west central Minnesota. WHAT DOES LIVE WIDE OPEN MEAN? Live Wide Open can mean many things: certainly the wide open spaces of rural Minnesota, but also having the breathing room to make a good life for oneself: where people don’t have to fight traffic gridlock; where the place they go for recreation is at their doorsteps instead of a three-hour car drive away; and where they can make it to their kids’ ball games in 10 minutes. Live Wide Open can also mean opening up people’s capacity to do what they love or what they’ve always dreamed of doing. There are a lot of opportunities for work and for starting their own businesses. I ALREADY DO PROMOTION, WHY IS THIS DIFFERENT? There’s a lot to do to make Live Wide Open a success, but it starts with the support and partnership of the cities, counties, chambers of commerce, businesses and organizations in our region. Frankly, a lot of you are doing this promotion on your own. So, why is this different? This is a campaign that encompasses— not replaces—all of the good work you are already doing promoting your jobs and your communities. 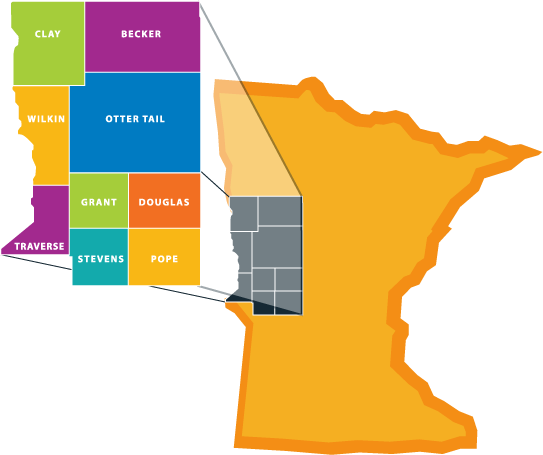 It would be akin to Explore Minnesota, promoting an entire region in areas that perhaps your marketing campaign may not be reaching, then inviting the people who are interested to learn more about the community, county or job that fits them best. We will work with you to create a landing page on livewideopen.com that features your business/organization/community, logo, contact information, local assets, and a link to your site. For more information, contact West Central Initiative at 800-735-2239 or livewideopen@wcif.org.